Finepoint’s range of smart glass is extensive. 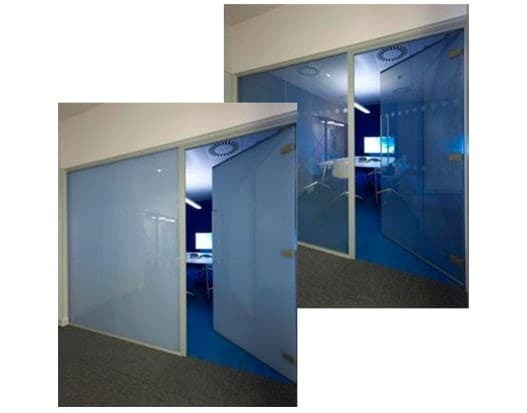 This includes liquid crystal glass, also known as privacy glass or switchable glass, for businesses and homeowners in London and throughout the UK. This electronic privacy glass is a perfect alternative to curtains and blinds, offering privacy as well as light at the flick of a switch. Our liquid crystal glass is a versatile solution for partition screens, windows and doors, as well as roof lanterns. Suitable for a range of uses and for all types of buildings, our smart privacy glass can help all property owners. Find out about our smart glass by calling 01923 229 949. What is Liquid Crystal Glass (LCG)? Liquid crystal glass is a laminated smart glass with a liquid crystal film. While the crystals are scattered, the glass is opaque. However, when an electrical current is passed through them, they align to make the glass transparent. This means that you can get a private space or a sun-lit room simply by switching your glass on or off. This electronic privacy glass is ideal for both homes and businesses in London as well as the whole of the UK. It can be used as a partition between rooms, or as window glass or door glass, in addition to a host of other uses. The opacity and transparency of the switchable glass can be controlled by wall switches as well as remote controls, or timers. Movement sensors and light sensors are also options, based on the needs of the customer. Our smart glass range includes LCG. Functionally, LCG is not dissimilar to electro-chromic glass, which can be programmed to control light entry and regulate temperature. Liquid crystal glass offers a number of benefits over other methods of light and privacy control. This makes them ideal for both the home environment as well as professional settings. Privacy glass comes with the privacy built into it. This switchable glass does not require screens or curtains to keep out sunlight or prying eyes. Simply flip a switch and the glass turns opaque. This, in turn, helps reduce the expenses involved in the installation and upkeep of these fittings. Because the liquid crystal glass is enough in itself, it presents a cleaner look, without hanging cords or curtains. The lack of dangling cords makes this glass ideal for places where childproofing might be necessary, like nurseries. It is also the perfect solution for hospitals and clinics. This privacy glass allows doctors and nurses to observe the patient simply by toggling between the opaque and transparent glass. Since they don’t need to go in every time, they can control the spread of infection without it affecting the patients’ privacy. They also do not hold on to infectious pathogens like a curtain would as the surface can be wiped and disinfected easily. Since liquid crystal glass is laminated, it is more difficult to break. Even if it does break, the pieces will not scatter and injure anyone standing near it. Even the broken pieces themselves will not break into dangerous shards, further reducing any chances of injury. While sunlight can be essential for the mental well-being of office workers, too much of it can lead to the room overheating or furnishings fading. Our smart electronic privacy glass is designed to keep out the worst of the sun’s radiation even when transparent. Its opacity can be used to modulate the amount of light that enters the room. With our liquid crystal glass, it is possible to get enough natural light without it bleaching the décor. Since the liquid crystal glass controls the infrared radiation as well as the ultraviolet radiation, this glass can help control the amount of solar heating a room receives. It is also insulated to prevent the warmth inside the room from escaping out. This gives our customers better control over the comfort levels of the property. Whatever the scope or nature of your project, we have smart glass that’s suitable. Talk to one of our experts today to find out which products meet your specification. If you want to learn more about our liquid crystal glass, talk to us directly by calling 01923 229 949. If you’d like us to call you, send us a message, and we’ll make contacting you our priority. Because Finepoint designs, manufacturers and fabricates its products, you’ll have one point of contact through your project. You can even visit us at our dedicated factory in London to see our range of privacy glass – and other products – by booking an appointment online. For an electronic privacy glass quote, talk to us today. If you are interested in our other products too – which include aluminium bi-folds and sliding patio doors and wine cellars – please let us know when calling. We look forward to helping you with your enquiry.